"You think acting could be your purpose?" Saturday Night Live alum Bill Hader together with Silicon Valley showrunner Alec Berg have created an unconventionally dramatic take on some very conventional Hollywood comedic material for their new HBO show. Hader plays a depressed, sensitive hitman and Marine vet, the eponymous Barry, who stumbles his way into a low-rent acting class that gives him an unexpected dose of inspiration to his murderous life. 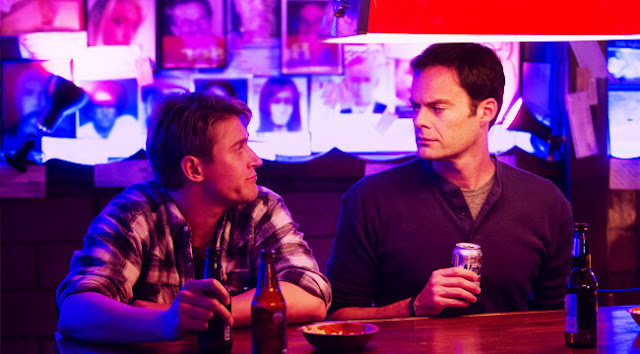 Hader, who directs the first three episodes, has said he wanted the violence and killing in Barry to feel real and not be desensitizing. He describes the two very different but parallel sides of the show against each other. The hitman parts are "high stakes, no drama" as Barry acts as a total professional, emotionless murderer for hire and the acting portions are "high drama, no stakes¹" riffing on the overdramatic nature of typical, delusional actors. How Hader contrasts the beauty and coldness of both contract killing and situational comedy is quite stylistically interesting. Having never directed anything before, his patience behind the camera and deftness at balancing tone with his and Berg's tricky subject matter is impressive without being showy. Berg and Hader have assembled a quietly impressive cast of character actors to play off Hader's straightforwardly depressive and earnest performance. Stephen Root as Barry's handler and surrogate father figure is equally protective and creepily manipulative. The jovial Henry Winkler is suitably cast as a hack acting coach who trades in self-help tips while hocking his own self-important philosophies on drama with a deceptive smile. Actress Sarah Goldberg shows so much vibrant enthusiasm as a stereotypical, wide-eyed aspiring actor with a host of competing motivations and an ultimately sunny but painfully genuine disposition about a career in show business. Her combination of effortless charm mixed an easygoing nature feel very appropriate to the Hollywood adjacent setting. What's most promising about Barry, aside from Hader's continued range as both a comedic and dramatic performer, is the refreshing, original take on the hitman turned actor premise. The character movements between acting highs and violent lows make the half-hour dark comedy so naturally moody and appealing. It's a truly engrossing turn from Hader and company with so many possible directions to go in.